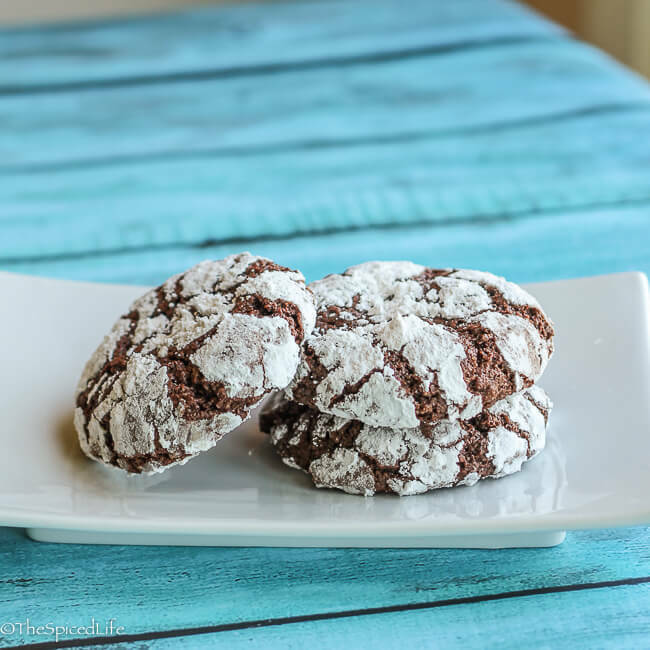 These Nibby Chocolate Crinkles are rich, intensely chocolate, and and not at all too sweet; instead their bitter complexity is complemented by the burst of sweet from the powdered sugar. I was provided with a copy of Cookie Love by Blogging for Books in exchange for an honest review. Affiliate links have been used to link to items I am discussing. On his way home from the breeder. 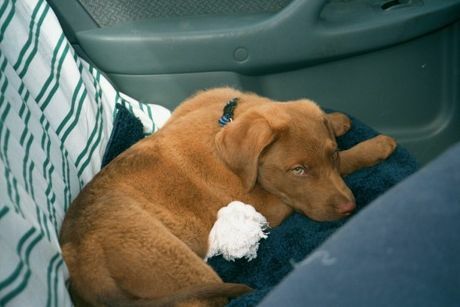 To save him a plane ride, we picked him up from an hour outside of Montreal after a vacation in Boston–and discovered for every moment of the 11 hour drive home that he got horribly carsick. Hence the thrilled with life expression! The general look the day Loki came home after Finnegan had already been there for 24 hours. He tried to growl and charge my adult German Shepherd off the property. Luckily Loki was the best baby (canine or otherwise) dog ever and he just ignored Finnegan and walked in. I am pretty sure Finnegan always felt he should have been an only dog. 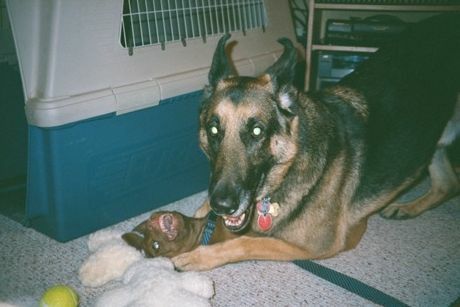 This is really more a Loki memory–but he was so darn cute teaching puppies how to wrestle. 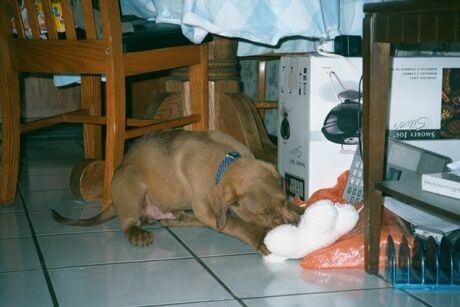 Loki had owned this sheepskin stuffed dog toy his entire life–and it did not survive Finnegan. We tried replacing it 3-4 times before we finally gave up lol. 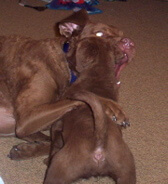 Finnegan passing on his excellent wrestling knowledge that he got from Loki by wrestling with Delilah when she was a puppy. OK this isn’t really a memory, the picture just makes me laugh. But one memory I do not have a picture for is when we lived in Pennsylvania our property was fenced along side a 55 mph road. And for some reason nothing made Finnegan angrier than semi trucks driving by our property. He would chase them barking as though they were intruder animals! So the thing about Finnegan–and Chessies in general–is that they do not handle change well (in my experience). So with every move and every baby, Finnegan got a little wonkier. 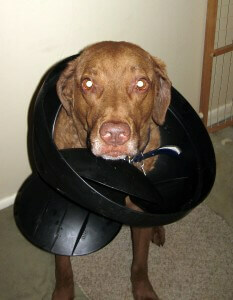 I have written many times on this blog about him stealing food, and he always got into the trash, and one of my favorite memories has always been his complete indignation when this trashcan lid got stuck on his head. So given that Finnegan hated change and got horribly stressed out by it (I remember once finding him frantically eating a bag of potato chips with his tail tucked between his legs!) I am so glad he got these last 6 years at our current home. We have 5 acres for dogs to play, we took him down to the creek every year until this spring where he played in the watering hole. 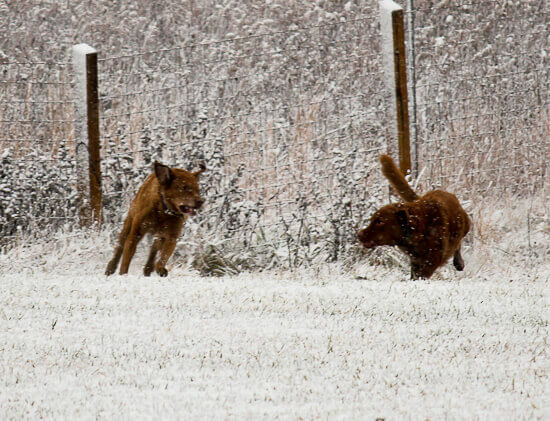 And he was constantly finding stuff to chase happily, as he is here (he is the one on the left). I am sorry if this was excessive or more than you needed, but as I mentioned this was hard on my kids. And Sammy especially asked me if I would write about it, and I said sure, because I had written about Loki (you may notice that Finnegan straddled 2 eras–the one without access to instant great pictures and the one with). Well she has been asking me about it since, so I knew it was important to her that Finnegan get proper tribute. I think this final picture says it all. Despite the stress, he was at the end of the day one happy dog and had a good life. So you might have thought this would be an awkward segue, but actually not at all. Why? Because Finnegan had to go to the emergency vet not once, but twice, over getting into chocolate. And as the local vets told me more than once, anyone else’s dog eats chocolate and they get into Hershey’s and do not need any treatment. But as you all know I am a chocoholic and a chocolate snob (a bit) to boot, so it actually was poisonous for him. 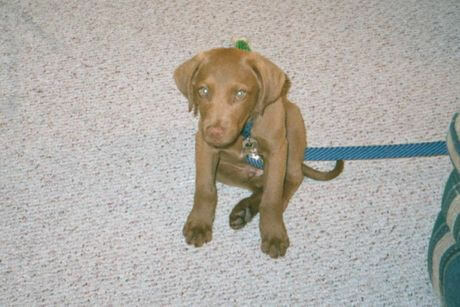 The worst was when he ate my sister’s Christmas present of 78% cacao (12 oz!) Dolfin hot chocolate that they no longer even sell in the States. I am not sure she ever forgave him! So I know he would love these cookies, because they are not at all too sweet and are instead intensely, wonderfully chocolate-y. OK about the cookies! And I cannot tell you how excited I am about these cookies. 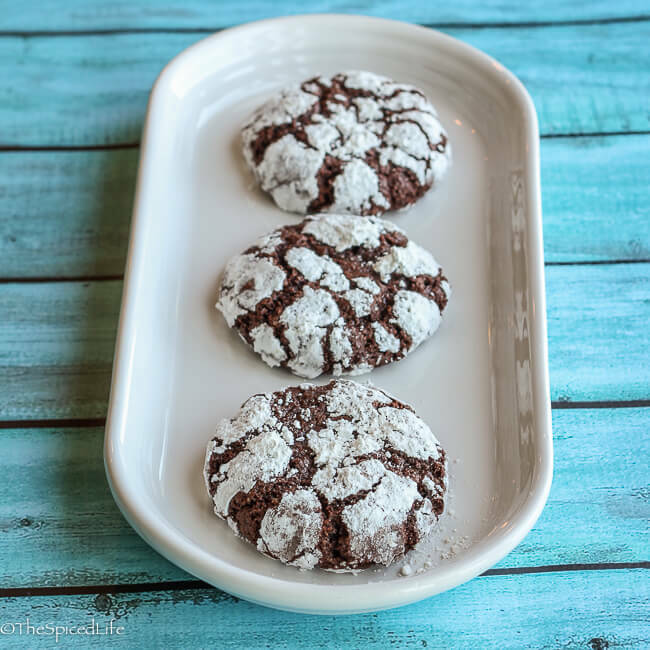 Tiny bit of backstory is that I tried making chocolate crinkle cookies once, and was so turned off by how sweet they were that I never tried them again. And then Mindy Segal’s much anticipated Cookie Love: More Than 60 Recipes and Techniques for Turning the Ordinary into the Extraordinary arrived. First of all it was love at first sight with the entire book. 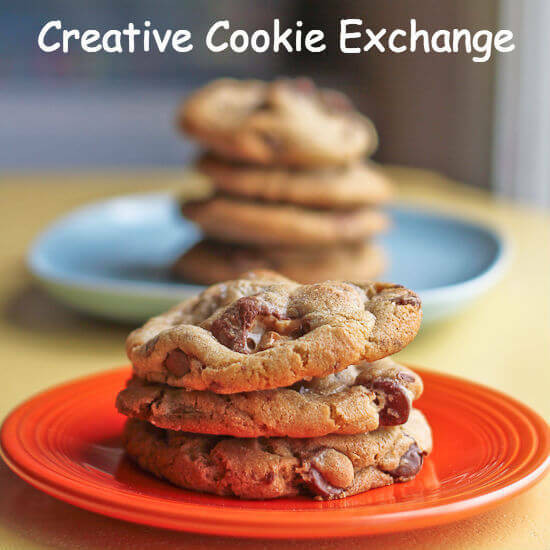 The flavors are so interesting and so creative in 90% of the recipes–if you are bored with your chocolate chip, oatmeal, sugar and peanut butter cookie routine this is the book for you. The rugelach flavors, for example, had me drooling (raspberry rose! cocoa nib hot fudge! strawberry rhubarb with oatmeal streusel! cinnamon brickle!). I think I have all of the recipes bookmarked. 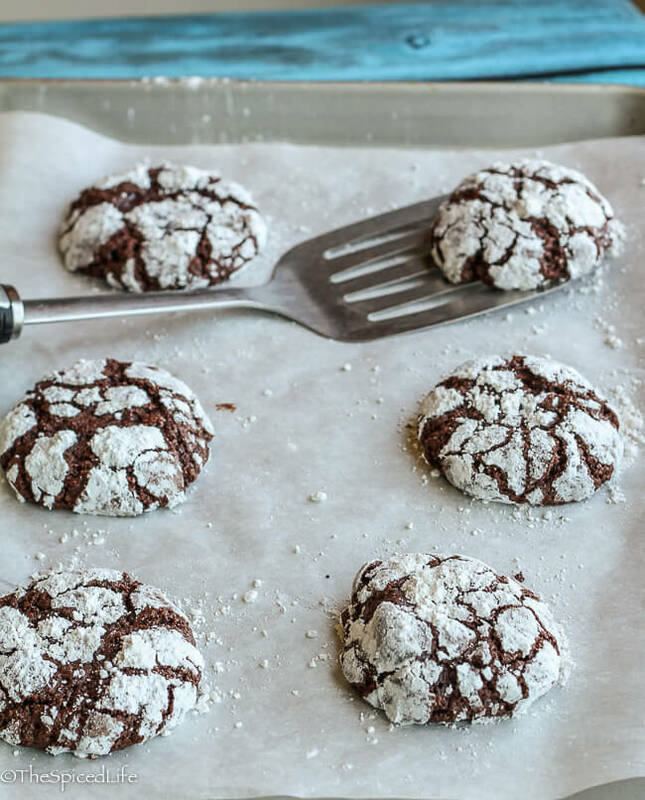 After studying all of those interesting flavor combinations I decided that Mindy Segal could not possibly be a baker who would eat saccharine sweet crinkle cookies. I did have one complaint about the book, but it is nothing that even a moderately experienced baker cannot work around. Mindy Segal prefers to measure with cups and spoons (i.e., volume) instead of weight, and to make things even a tad more frustrating, she does not use the more common fluff, spoon and sweep method. Instead she uses the dip (without fluffing) and sweep method. I weighed my flour and cocoa powder because of this so I have told you exactly how much I used. Now mind you I had been burned before so I hedged my bets by adding cacao nibs to the cookies as well, an extra layer of sweet-combatting complex chocolate bitterness. While I do not believe the nibs were necessary per se, I adored these cookies exactly as I made them. So I leave it to you whether to add the nibs. Another interesting note about these cookies? They are dairy free and use oil, but are not at all cake like or overly fluffy. 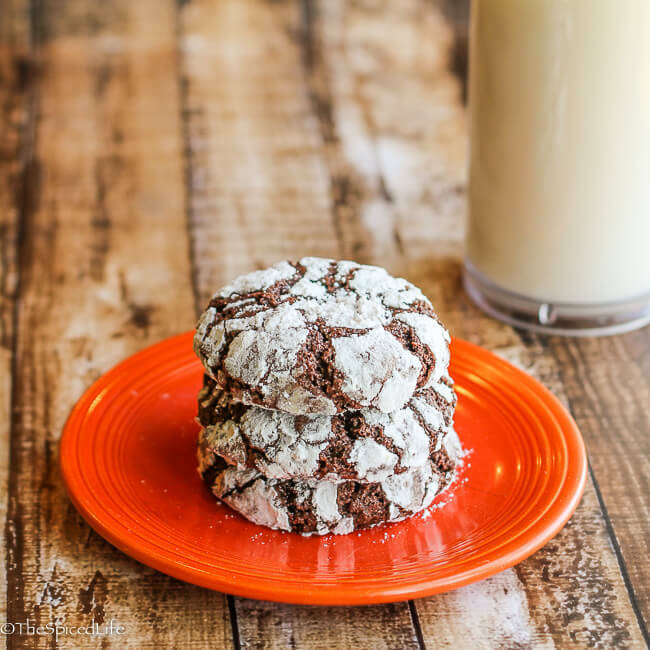 So they are a great cookie to make for your dairy allergic friends. I switched the flour to white whole wheat flour, and the substitution worked perfectly. I won’t call these health food, but I am fine with slipping in whole grains where it will not affect the finished product, as is often the case with drop cookies. I tweaked the name of these a little, because of adding the nibs. 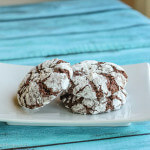 Segal calls them Brownie Krinkles, but I went with Nibbly Chocolate Crinkles just because. I happened to find a Chicago based website that has shared the exact recipe, so you can peak at it if you want her exact recipe complete with head notes. Closely adapted from Mindy Segal. She instructs--and I followed her advice--to be sure to mix the chocolate into the oil and sugar while it is still warm. This "dough" will seem more like a thick batter until it has chilled. As a result, even after chilling it is a joy to scoop as it does not get nearly as stiff as a butter-based dough. Do not overbake. Note that this dough requires chilling, and the prep time does not include that chilling time. Begin the chocolate melting in the double boiler. Stir occasionally. While it is melting, whisk together the flour, cocoa powder, baking powder and salts. Set aside. Keep stirring the chocolate. When it is melted smooth, remove it from the double boiler. Place the oil and sugar into the bowl of a stand mixer. Mix on medium low speed for 1 minute. With the mixer running on low speed, pour the warm chocolate into the mixer bowl. Scrape out the chocolate bowl to get it all added, and then stop the mixer and scrape the sides and bottom of the mixer bowl as well. Mix on medium low speed for 1 minute. Add the eggs, one at a time, beating on medium speed for 5-10 seconds per egg. Scrape down the sides and bottom of the bowl as needed. Add the vanilla and beat on medium speed for 30-40 seconds. Add all of the flour mixture and cacao nibs and mix on the lowest speed until the dough comes together but still looks "shaggy," about 30 seconds. Switch to a large silicone spatula and scrape down the sides and bottom of the bowl and fold until the dough has come together more homogeneously. Cover the dough with plastic wrap and then chill for at least 30 minutes or overnight. When you are ready to bake, preheat the oven to 350 F. Line your cookie sheet (several cookie sheets if you are baking them all at once) with parchment paper or silicone mats. Scoop 1-2 tablespoon (just be consistent, I did 2 T) sized balls of dough and then lightly and quickly roll them into a ball. Then roll those balls in the sifted powdered sugar. Roll them quite thickly--and even sprinkle a little extra sugar on top of each ball on the cookie sheet. I did 6 cookies to a pan. Bake for around 12 minutes, rotating the pan after the first 8 minutes (front to back--and top to bottom if you are baking 2 pans at once). The cookies are ready to come out when they form crinkles and are set in the middle, but still shiny. Do not overbake. Let the cookies cool for 2-4 minutes on the cookie sheet, before being transferred to a cooling rack. For those of you who like collages to pin, I was pretty happy with this one. I am starting to have fun playing with Photoshop and PicMonkey! I’m so sorry to hear about FInnegan!! He was definitely well loved, and that is what matters most when it comes to pets! I’ve had cookie love sitting on my counter and haven’t made anything from it yet! It’s the problem of everything looks too good so I can’t decide lol. Thank you Joanne. And I understand re the book! And Finnegan would have approved of those priorities lol. Always gotta have cookies! Thank you. we usually have a big party and have special treats and eat fun doggy food. I too, have old photos and digital photos and it makes putting together a memory frame a bit tricky! 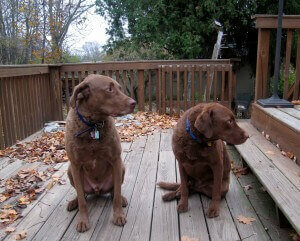 So long Chessie spirit….see ya! So sorry to hear about lovely Finnegan. What a sweet tribute! And these cookies look amazing! Thank you. He would have found cookies the perfect tribute too. Thank you so much. Comments from all of you guys are really making my day today. We are still in a funk for sure. I think I need to get my hands on that book. These look awesome! Love the addition of cocoa nibs here. I am so sorry for you and your family about Finnegan – but I’m glad you found a way to remember him and also to let us in on his adorable personality. As to the cookie part of the post, well these cookies are my idea of perfection. As a matter of fact, I’m pinning the recipe because as soon as I feel justified in treating myself, I’m going to make an entire batch just for me. I hope you do! And thank you for your comments re: Finnegan. Sammy was pretty happy with my post, so I think I got it right. 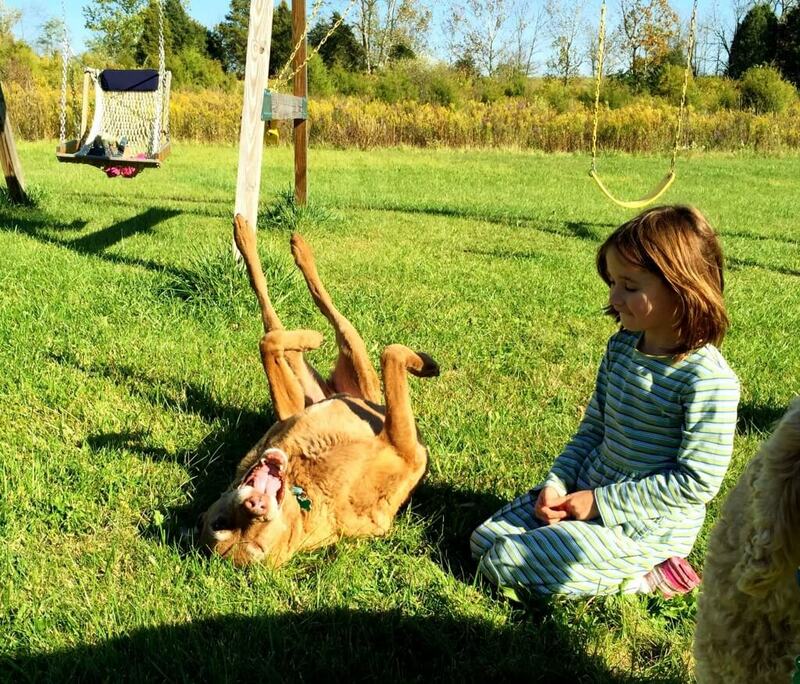 That last photo with the kid and the dog really got me. Yeah it does me too. That is my daughter Sammy, who adored Finnegan. It was just last fall, so I tell myself he really was a happy old guy. Very cute story Laura. It must have been very hard with the kids being older. These cookies look delicious. Love the cocoa nib idea! Italy was a godsend in this regard. I suspect when we get home it will hit us all over again. Thanks re cookies! Oh my gosh Laura, this is so touching. Tell Sammy thank you for encouraging you to write this. Simply beautiful. xoxo.